Shoulder surgery can be a scary event. Patients have pain, swelling and often can’t move the arm much at all. Surgeons suggest different postoperative instructions after rotator cuff surgery, labral repairs, and other shoulder procedures. While restrictions and instructions vary based on the type of surgery, there are some general ideas that are at least worth considering for a patient undergoing shoulder surgery. Ask the anesthesiologist about regional anesthesia before the surgery. With most surgeries, patients receive general anesthesia, where they are essentially put to sleep. Shoulder surgery is usually no different. There are several options for anesthesia during shoulder surgeries, though. The anesthesiologist can often perform some form of regional anesthesia. This “nerve block” offers pain control during surgery and for a variable period of time after surgery. Instead of pain, a patient might instead experience a completely numb arm for 6 to 36 hours. Regional anesthesia doesn’t completely eliminate the need for pain medications, but it can help many people through the first hours and even days after surgery. It can be helpful for the patient to take pain medicine as the block starts to wear off. The patient can discuss this option with the orthopedic surgeon before surgery in the office and with the anesthesiologist on the day of surgery. Use ice or cold therapy devices to decrease swelling. Ice or other forms of cold therapy are crucial to help decrease swelling of the shoulder, which can cause much of the postoperative pain. Get a large supply of ice for ice bags or cold therapy devices ready so that they are available when you get home. Cold gel packs or bags of frozen peas can work as well. 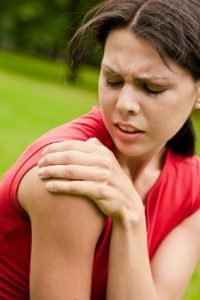 Orthopedic surgeons usually recommend that patients ice the shoulder for short periods as many times as possible. Don’t leave the cold treatments directly on skin for long periods of time. Take narcotic pain medications as needed. Most patients undergoing shoulder surgery require narcotic pain medication for a few days or even a week or two. Staying ahead of the pain in the early hours after surgery can often help keep pain under control. Many people have good results taking the medication shortly before the anesthesia from surgery or the last dose of medication wears off. Most of these medicines can cause nausea or vomiting. Taking a dose before going to bed might help with sleep early on as well. Prepare for not being able to use your arm. 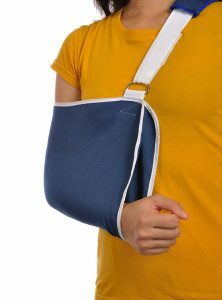 Many shoulder surgeries, such as rotator cuff repairs and labral repairs, require at least a period of immobilization, such as wearing a sling. Other surgeries, like subacromial decompressions, don’t require the patient to keep the shoulder in a sling at all times. If your surgeon wants you to wear a sling all the time, you shouldn’t drive. Often you can work and perform many activities of daily living, such as typing at a computer, with your arm at your side. Each patient should adjust his or her work and home duties accordingly. Ask your surgeon before the procedure about postoperative shoulder immobilization. When talking to the surgeon immediately after the surgery, the family should confirm the instructions for use of the arm. Have a friend or family member assist you at home and away from home. Having your spouse, one of your parents or even a friend at home can be critical to help you with daily activities. You might only need help for a few days. Whether it’s picking up items to keep you from having to use that arm or driving you across town, having someone assist you can help you avoid pain in that shoulder and also help you stick to postoperative restrictions. When can you drive after shoulder surgery? Try to find comfortable ways to sleep. It can be really challenging to sleep well after shoulder surgery. Sleeping with the arm in a sling or shoulder immobilizer is hard for many people accustomed to sleeping on their sides or stomachs. Rolling onto that surgically-repaired shoulder can hurt. Consider sleeping in a recliner or on a sofa with the arm against the cushions. That arrangement could keep your arm still and allow you to fall asleep easier. This list is not at all intended to provide specific medical advice, but I did want to offer some general suggestions in case you or a loved one would soon undergo some sort of shoulder surgery. You should check with your orthopedic surgeon for specific advice based on the exact nature of the procedure.